(Nanowerk News) Double-stranded DNA must disentangle itself into single strands during replication or repair to allow functional molecules to bind and perform their various operations. Cellular proteins specifically bind to single-stranded DNA to prevent their premature recombination. Unfortunately, detailed studies of these DNA–protein interactions have been hindered by the need for expensive instrumentation and time-consuming labelling techniques. Yen Nee Tan at the A*STAR Institute of Materials Research and Engineering and co-workers have now developed a convenient method to characterize the interactions between single-stranded DNA and their binding proteins ("Study of Single-Stranded DNA Binding Protein–Nucleic Acids Interactions using Unmodified Gold Nanoparticles and Its Application for Detection of Single Nucleotide Polymorphisms"). The researchers used the optical properties of gold nanoparticles to probe the mechanism of protein–DNA binding. When the nanoparticles were well dispersed in solution, they yielded a bright red color, but when aggregated, the solution changed to blue. Tan and co-workers discovered that when single-stranded DNA and its binding protein were both present in the solution, coupled with a salt that stimulates nanoparticle aggregation, the DNA remained red in color, indicating that the DNA–protein complexes had bound with the nanoparticles through electrosteric stabilization forces. In contrast, when the protein or single-stranded DNA was introduced alone in the salt solution, there was a greater shift to the blue-grey color, indicating nanoparticle aggregation (see image). 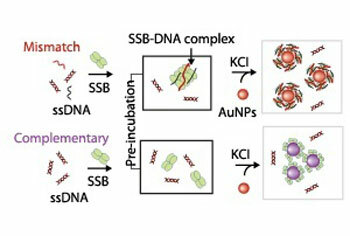 "The greatest challenge in this work was to determine the optimum conditions for single-stranded DNA to bind with its binding protein to form complexes that confer the highest stability to gold nanoparticles from salt-induced aggregation," says Tan. The researchers attribute binding of the nanoparticles and the DNA–protein complexes to the presence of sulphur-containing groups in the protein, which are known to create strong bonds with gold. The protein molecules alone are smaller in molecular size than the protein–DNA complexes, leading to a less effective steric stabilization of the nanoparticles. Tan and co-workers showed that there was a minimum length of DNA sequence under which the binding protein–DNA adhesion mechanism could operate. They found that the binding protein had a preference for binding to specific chemical units (bases) which make up DNA, and were able to spot DNA sequence variations, called single nucleotide polymorphisms (SNPs), even at the extreme ends of the molecule which are difficult to identify. Double-stranded DNA with SNPs cannot bind together so closely. The binding protein can thus attach to the dissociated single-stranded DNA to form protein–DNA complexes, offering sites to which gold nanoparticles can adhere. "We plan to further develop this assay into a hassle-free genotyping assay to detect SNPs in real biological samples containing long genomic DNA," says Tan.